Cut 21 layers of phyllo, suiting the baking dish dimensions ( 8 x 9 x 2 inches) and cover them with damp cloth. Grease a baking dish and leave aside. Roll the gingerbread cookie dough to have two layers of a baking dish size. Place 7 phyllo sheets into baking dish, one at the time, brushing each sheet with vegetable oil once it's in the dish, place next phyllo and oil until you have 7 layers. Lay one gingerbread cookie layer on the phyllos in the dish and sprinkle with chopped pistaccio. Repeat adding 7 phyllo sheets, oiled when placed into the dish. Place the second cookie layer on the phyllo, sprinkle with chopped pistaccio and finish with 7 layers of phyllo, oiled as previous ones. Using sharp knife, cut baklava into squares pattern. Bake for 48 minutes or until golden brown. While baklava is baking, boil water, sugar and lemon juice in a small pot until sugar is melted. Once baklava is baked, pour the syrup over the top immediately, using table spoon. 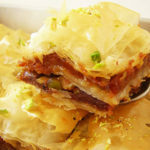 Let baklava cool completely ( over night, if possible ). If any pistaccio left, garnish baklava before serving.